The eighth GOP debate has seen candidates battling it out in incredibly contentious, intense ways. Already, Marco Rubio and Chris Christie have butted heads at every turn. Another rivalry has made itself front and center once again as well. Republican frontrunner Donald Trump returned to the debate stage with a vengeance, breezily answering a question on eminent domain with the businessman flair that has clearly gotten him far in his real estate business. Former Florida Gov. Jeb Bush immediately fired back criticizing Trump for an alleged shoddy understanding of eminent domain and bringing up an incident in Atlantic City in which Trump attempted to seize property under that law in order to reportedly build a limousine parking lot. How did the Donald respond? 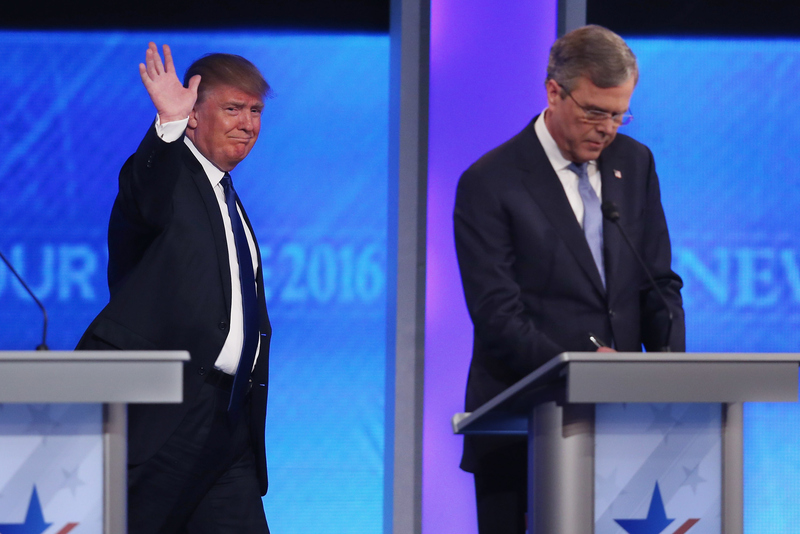 Donald Trump shushed Jeb Bush at the GOP debate. It's this final comment that immediately got Bush to pounce. The candidate questioned Trump on the difference between public and private projects, decrying the Donald. "What Donald Trump did was try to take the property of an elderly woman in Atlantic City to turn it into a limousine parking lot for his casino," Bush said. The exchange only got more heated. Trump talked over Bush, shouting "quiet" and shushing him as well as saying "let me talk" repeatedly. The frontrunner was met with loud booing from the audience. The story of Vera Coking, whose home sits right next to a Trump Casino in Atlantic City is true, as is the assertion that the property would be torn down for limousine parking, though the outcome luckily worked in the widow's favor. It took a court ruling in 1998 to prevent Trump and the government from seizing her house, though the battle wasn't pretty. The war of words between Bush and Trump has been similarly ugly. Trump's wildly disrespectful behavior perfectly summarizes the ongoing feud continuing to develop onstage and on the campaign trail.